This article is reposted from graphdoctor.com with the kind permission of Richard Layton. Introduction: who, why, and how? Who this post is for. 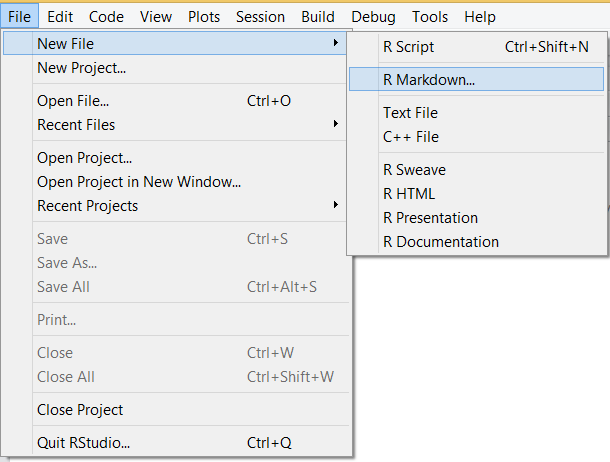 This post is for RStudio users who want to use R Markdown (Rmd) scripts to create Word (docx) documents and would like to improve their control of Word styles and document design. I assume the reader has RStudio and MSWord installed but otherwise I try not to skip any details. Why we need Rmd to docx. Nearly all my professional work is collaborative and nearly all my collaborators are MSOffice users. For my portions of the work, I use R and RStudio and my reports are dynamic and reproducible. My collaborators, like many folks, use Word and Excel and their work-flows include a lot of point and click, copy and paste, and manual formatting. But R Markdown (v2) has given me collaboration superpowers! I can do reproducible work in R (making me happy) and format the output report in Word (making my collaborators happy). This post is about how you can learn to do that too (making you happy). Reproducibly assigning headers and footers. (This is possible in Rmd to PDF, but not in Rmd to docx as far as I can tell). If you need control over more than Word styles, for example, placing a company logo in the header, you might try the ReporteRs package. I compared ReporteRs to R Markdown (v2) in an earlier post. 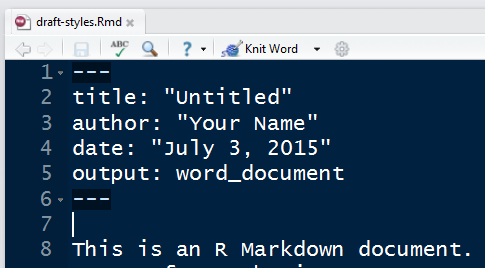 In RStudio, open a new R Markdown file. 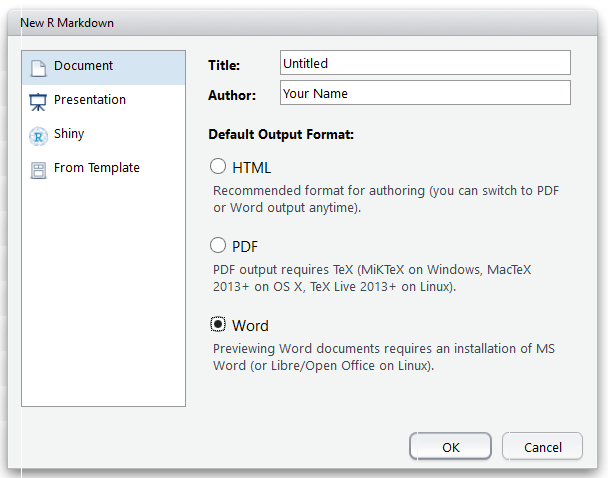 In the dialog box that appears, set the output format to Word. Title and Author are unimportant at this point. An Rmd file appears with front matter and some sample text. Save this Rmd file to a convenient directory using a descriptive name. I called mine draft-styles.Rmd. In RStudio, click the Knit Word button. A Word document should appear. Save this Word file under a new name (for example, word-styles-reference-01.docx) in the same directory as the R Markdown file. This Word document is the first draft of your styles reference docx file. Its textual content is irrelevant—its Style settings are what you will be using. Continue to work with the word-styles-reference-01.docx file. Select the Home ribbon tab and in the Styles group click the Styles window launcher (in the lower right corner of the group). Suppose I want to change the format of the main title. I select the title in the Word document. Then in the Styles window, I scroll down until I find the style already assigned to the text I selected. In this case, the assigned style is Title. In the Word document, I reformat the title in Palatino Linotype, italic, not bold, and change the color to black (though you may assign any settings you like). 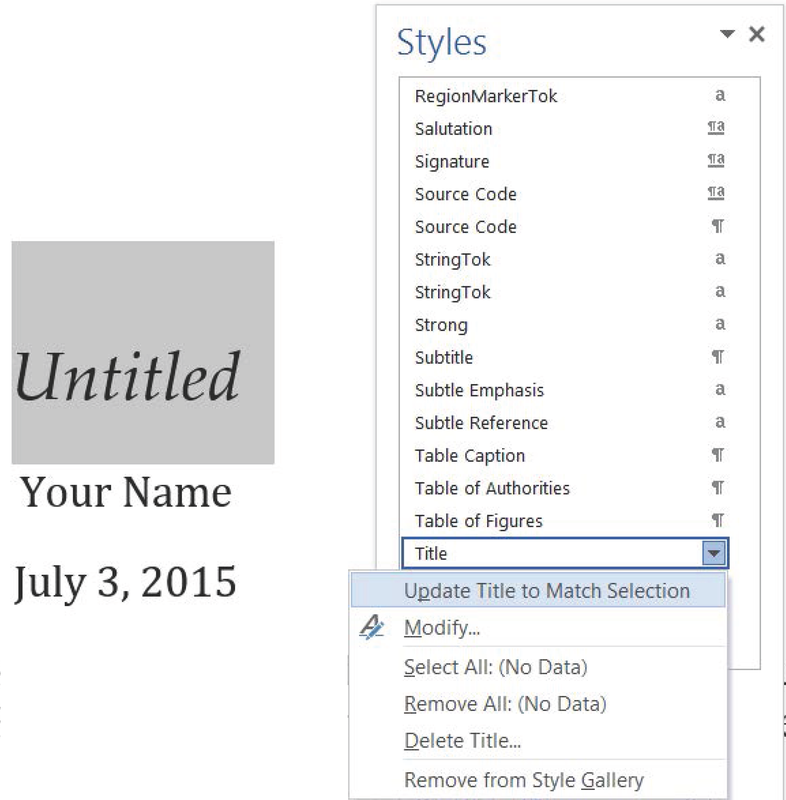 In the Styles window, click on the Title style drop-down menu and select Update Title to match selection. You can repeat for as many styles as you like, but I suggest incremental style editing (described after the next section). Caution. Reformat assigned styles only. Neither add new styles, change a style name, nor assign styles different from the rendered defaults. Return to RStudio. Close the draft-styles.Rmd file. We won’t use it again. Create a new Rmd report file called test-report.Rmd with title Test Report and output format Word. 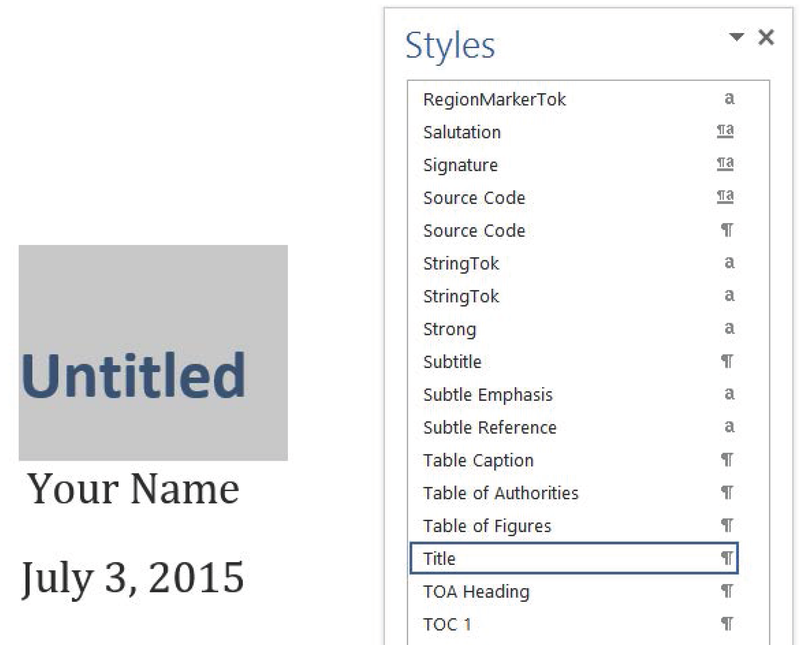 In the Rmd front matter, add new output arguments to format the report using the styles reference document. A new Word document should appear, with the title correctly formatted. I write a new Rmd report with my latest style reference docx file as the output format, then Knit Word. I review the formatting of the new Word document. If all formatting is fine, no change to the style reference docx file is needed. If style editing is needed, the cause could be that a style is in use that I’ve not used before or a style I have used before is applied in an unexpected way. In either case, I save the report as my new style reference document, e.g., overwriting word-styles-reference-01.docx or saving it with a new number word-styles-reference-02.docx and use it as the reference_docx: argument in the front matter. To illustrate, return to test-report.Rmd and add some headings and text as follows. And I have this next subsection. Open the Word Styles dialog box. You’ll find that the styles in use are Title (a style we edited earlier), Author, Date, Heading 1, Heading 2, and Normal. For practice, edit these styles. Try changing the font type, font size, line spacing, space before and after paragraphs, etc., until the formatting meets your needs. Return to the Rmd file. If needed, edit the front matter to include the correct reference_docx:, then Knit Word. The draft report should be correctly formatted. My styles changes are shown here. That’s pretty much all there is to basic management of Word Styles from an R Markdown script. Congratulations! You now have Rmd-to-docx superpowers. 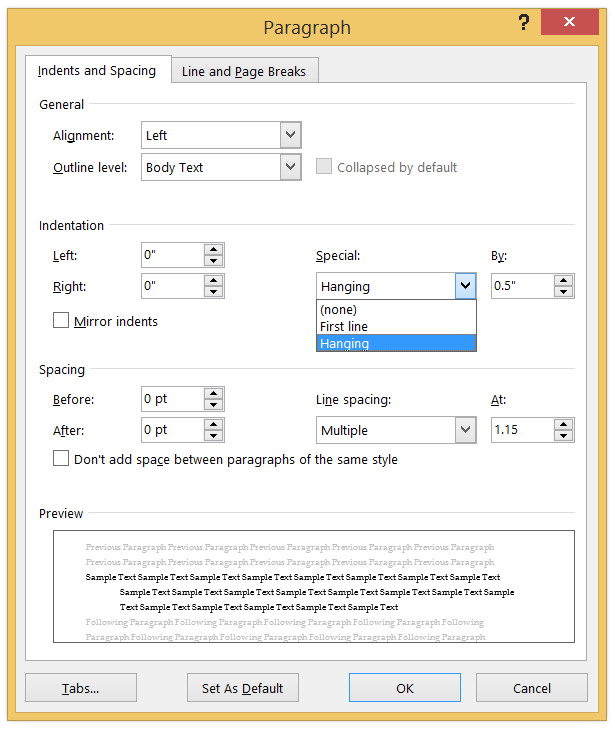 Setting margins is not the same as setting styles, but the margins set in the styles reference docx are applied in reports calling that reference. Open the styles reference docx file. Select the Page Layout ribbon, Page Setup group, Margins list. 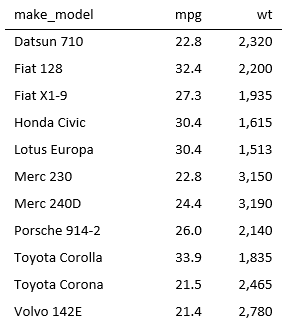 Select the margins you want. Save. If making your work reproducible is important to you (and it should be! ), you are probably organizing your directories and files in some systematic way. My current approach is to assign the project working directory to the project top-level directory by using the RStudio project feature and then create the following sub-directories. The two directories I want to discuss here are common and reports. The common directory is for document elements I re-use from project to project, e.g., business logo, LaTeX preambles, bibliography files, etc. I save my styles reference files in this directory. The reports directory is for Rnw or Rmd markup scripts that produce reproducible reports. In Ch. 8 of (Stodden, Leisch, & Peng, ed. 2014), Hoefling & Rossini note that support for tables is one of the impediments to reproducibility. Packages knitr and pander have made some progress in this area. The knitr package provides a kable() function for creating tables with a minimum of fuss but with limited control of formatting. However, the default alignments are good, making this a useful function for initial drafts. 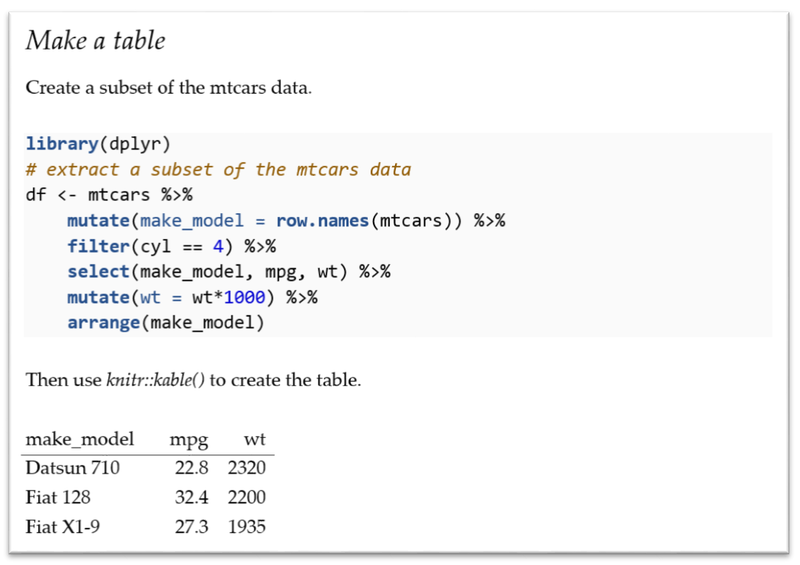 Create a subset of the mtcars data. 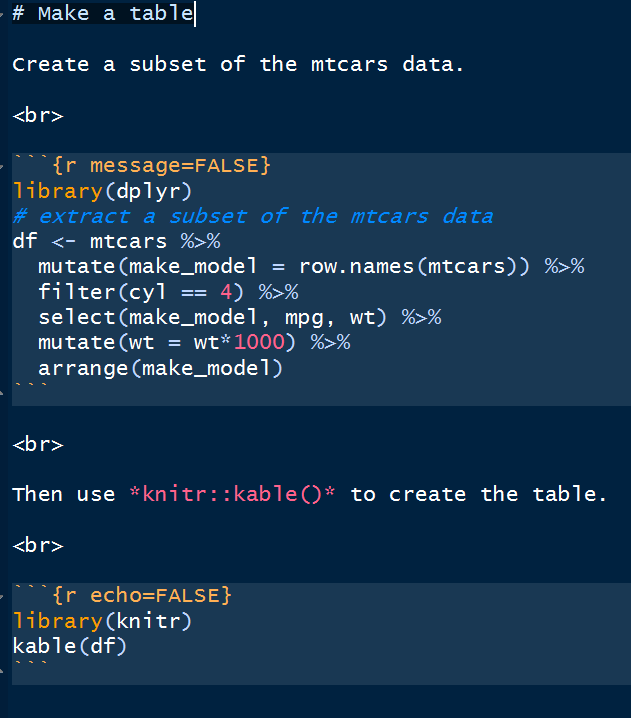 and a code chunk to extract a subset of data from the mtcars data set. 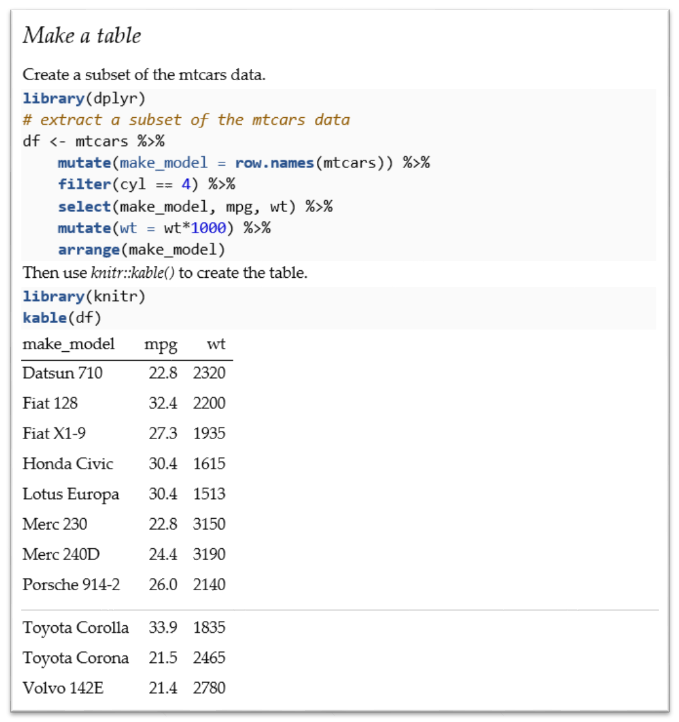 Then use *knitr::kable()* to create the table. The first thing I notice is that I need some white space to separate text from the code chunks and from the table. We can use the HTML line break tag <br> on its own line to create the extra white space. (Markdown began, after all, as a “text-to-HTML conversion tool for web writers.”) Note too the message=FALSE option in the first code chunk and the echo=FALSE option in the second code chunk. To edit style of the table entries, select one entry, reduce the font size and change the typeface to a sans serif font, find the style in the Styles menu (Compact), and Update Compact to match selection. Save As and overwrite word-styles-reference-01.docx. Return to test-report.Rmd and Knit Word. All the table entries should match your new style. If the kable() output does not meet your needs, the pander package is an R pandoc writer that offers additional control for tables and other elements. In the Rmd file, add a code chunk to set some pander table-layout options. I usually place initializing code chunks like this at the top of a script. 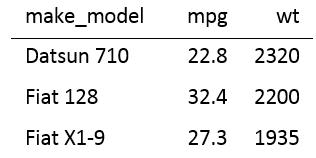 The style of the table entries using pander() is the same (Compact) as the style in the earlier table made with kable(). As specified in the pander options, numeric values are right-aligned, character values are left-aligned, and the thousands separator (big mark) is a comma. The first line includes my label Stodden2014 to identify this reference. The file is saved as RepResRef.bib in my common directory. See any BibTeX reference, for example, the page at verbosus, for style possibilities and arguments. Specify the bibliography file. Add the bibliography argument to the front matter including the relative path if needed. Cite references in markdown format. To illustrate, in the Rmd report file, add some text with the citation. Include a references section heading at the end of the Rmd script. Format the bibliography style. In the Word report document, select the reference. Select the Home ribbon tab, and in the Paragraph group, click the Paragraph settings window launcher. In the Paragraph settings window, change the indent to Hanging. Click OK. In the Home ribbon tab, in the Font group, change the font size to 9. In the Home ribbon tab, in the Styles group, launch the styles window. Find that style already assigned to the reference (Bibliography style) and, as we’ve done before, select Update Bibliography to match selection. Return to test-report.Rmd and Knit Word. The format of the reference should match the style changes we made. It will apply to future bibliography entries too. 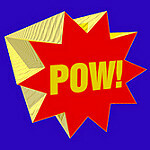 “Pow” by Sean MacEntee is licensed under CC BY 2.0. Stodden, Victoria, Friedrich Leisch, and Roger D. Peng, eds. 2014. Implementing Reproducible Research. Boca Raton, FL: Taylor & Francis Group LLC.